We had an amazing 2016 and are so thankful for the opportunity to do what we love every single day. After gaining experience over the last few years in a variety of positions, fields, and cities, we couldn't be happier to re-plant in the Atlanta area and embrace so much success in the early stages of our company. 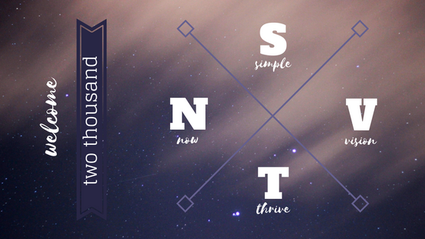 As we move into the new year, we’ve selected a few words to describe our focus and intention – for ourselves and for supporting our clients. SIMPLE: Let’s face it, the field of sport psychology is insanely complex! From parents trying to determine whether their child should work with a sport psychologist or a mental performance consultant, to training athletes to improve their performance by developing the skill of imagery, there’s a lot to know. Moving forward, we want to do a better job of keeping it simple – giving parents, coaches, and athletes what they need to know in the most concise, easy-to-understand way possible. Challenge accepted. VISION: Our vision from when we launched in 2015 has changed a bit, and we’re really excited about it. We support working professionals within small organizations and athletes age 11 and up from any sport (this has stayed the same). That being said, we’re really good at mentally preparing swimmers and runners to perform at their best. Abby has 12 years of competitive swimming experience and has been running recreationally for 8 years; John has been a competitive distance runner for the past 15 years and is a certified Level 1 USATF coach. Not to mention most of our clients are within these two sports. If you’re looking for someone who knows these sports inside and out, and who has expertise in sport psychology and mental skills training, we’d love to be your go-to resource. THRIVE: In starting a company from absolutely nothing, I think most entrepreneurs would agree you focus so much on surviving – trying to establish yourself, gain clients, and make a living. We couldn’t have asked for a better response and as such, we’re ready to shift gears – and invite our clients (and YOU!) to do the same. Instead of striving for perfection in everything, focusing on just getting through, or worrying about what will happen long term, why not concentrate on thriving? Make the most out of where you are now, invest targeted effort into your development, and find happiness in the life and opportunities around you. NOW: There’s certainly a time and place for reflecting on the past and planning for the future. But often when it matters most, we’re not in the present moment. The here and now. What’s right in front of you. We’ll be spending more time in the moment this year – observing and listening to understand our clients on a deeper level, celebrating success as it unfolds, having 20 seconds of courage to press play on something. We know this will lead to new ideas, better relationships, and greater opportunities. Stay tuned… we have some fairly sizable goals and ideas we’re launching this year and would love for you to be a part of it!